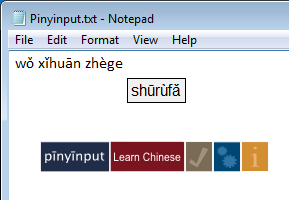 Pinyinput is an input method editor (IME) for Windows (and macOS) that makes it easy to type Pinyin with tone marks. You type 'Han4yu3 Pin1yin1' and Pinyinput outputs 'Hànyǔ Pīnyīn'. Pinyinput works at the system level, and so you can use it to type pinyin in a simple and consistent manner in any application. The current version is compatible with all Windows versions (including both 32- and 64-bit) since Windows XP (for macOS see here). Hundreds of hours have gone in to making Pinyinput a useful and convenient way to type pinyin. It has a suggested purchase price of $5, however you are welcome to pay more, less, or even nothing if you prefer. Simply enter the amount you think it's worth below, and then click the button to purchase and download. Free is fine if that is what you think Pinyinput is worth. If however after downloading and using Pinyinput for a while you decide that it might be worth at least the price of a cup of coffee, a song from iTunes, or maybe even a beer and a pizza, you can come back here at anytime. You can also make a donation directly from within Pinyinput by clicking the "Info" button on the far right of the Pinyinput toolbar. Want to improve your Chinese handwriting? 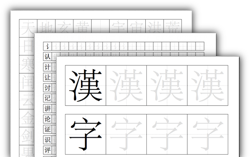 With Hanzi Grids you can create customised grid paper templates and worksheets for Chinese characters that you can download and print out. Simply enter some text, adjust a few sliders to set grid size, spacing and more, and then save as PDF. All changes are previewed instantly in the browser, for quick and easy grid creation. Hanzi Grids is from the same creator as Pinyinput. Pinyinput is distributed in the hope that it will be useful, but WITHOUT ANY WARRANTY; without even the implied warranty of MERCHANTABILITY or FITNESS FOR A PARTICULAR PURPOSE.